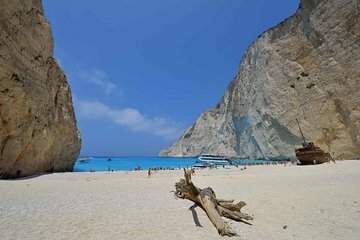 Segla till Smugglers Cove, även kallad Shipwreck Beach, längs Zakynthos kust på denna hel dags kryssning. Styr en sightseeingbåt i Zante Town och slappna av när du kryssar över stränder och orter. Passera de blå grottorna, släpp ankare från Smugglers Cove för att simma och dra i sikten och kryssa sedan tillbaka till hamnen med ett annat badstopp på rutt. Familjevänlig resa med hotellhämtning och avhämtning i utvalda hotell ingår. A must ! Boat itself is an experience and crew is amazing. Selection of drinks and food on boat is great. Stops for swimming ware highlights and once you see Navagio beach your heart stops for a sec. Entire day is full of impressions and this is a cruise that I can recommend to anyone. The pirate theme made the trip!! Having your photo taken with the pirate captain when you walk on board was great. Stopping at the shipwreck and swimming in the cove was amazing, and then stopping off near the blue caves for another swim in the clear blue waters was great. All in all a very worthwhile excursion. Amazing day! Throughly enjoyed the pirate ship and theme! The trip was Awesome, We traveled on the Pirate ship and toured one side of the island, saw the blue caves and the cove was beautiful. Everyone was given the opportunity to swim at the cove and by the blue caves. The crew on the Pirage ship were freindly and courteous and provided entertainment on board on the way back to Zakinthos. Good value for money and a really enjoyable day.